From the episode "The Trouble with Tribbles" in the original Star Trek TV series. This alien replica plush is the ultimate in Klingon detection. Features sounds and motion from the show. You need one... or 10... or 100... or 1,000... or... of these! Whatever you do, don't feed the tribbles! 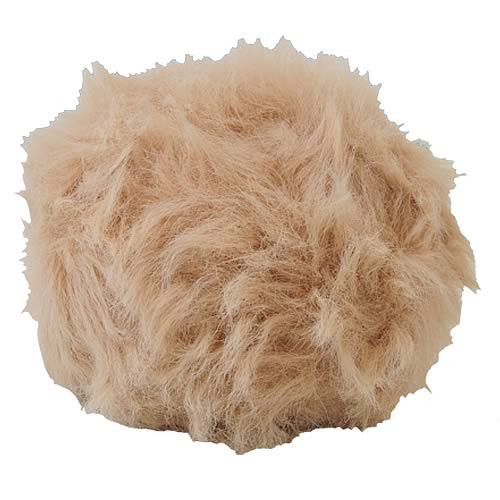 Recreating one of the most memorable and adorable aliens ever to appear on Star Trek, this beige Original Series Tribble Plush features authentic sounds and motion from the unforgettable episode "The Trouble with Tribbles." Trigger the tribble's calm, soothing coos or switch the 6-inch fur ball to agitated mode for the ultimate in Klingon detection. You can't call yourself a real Star Trek fanatic if you don't have one… or 10… or 100… or 1,000… or... of these! Requires 2x "AA" batteries, included. Ages 4 and up.